Former Cuban President Fidel Castro has made his first reported appearance outside Havana since handing over power to his brother in 2006. Cuban television showed the 83-year-old visiting a mausoleum in Artemisa, south-west of Havana, which honours Cuban revolutionary fighters. It is the latest in a number of recent appearances. Until now, Mr Castro has made only sporadic appearances on TV or in public since he retired from public life. However, he remains head of Cuba's Communist Party and continues to make his influence felt through regular newspaper editorials. Correspondents say the increase in the number of his appearances in recent weeks could be designed to emphasise that he remains part of the decision-making process. 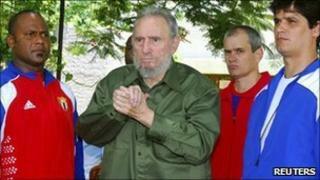 Mr Castro retired from public life in July 2006, when he underwent major surgery and handed over power to his younger brother Raul.